본 논문은 영조대 새롭게 안착된 도성 수성체제의 변화를 戊申亂의 전개 과정을 통해 살펴보고, 이후 영조의 왕권강화와 직접적으로 연결된 軍權의 통일화나 分權의 문제를 병법서 편찬의 변화를 통해서 살펴보고자 하였다. 특히 무신난의 전개 과정의 경우는 실제 반란군을 토벌하기 위해 구성된 관군의 구성형태부터 당시 활용한 전술의 형태까지 세밀하게 분석하여 당시 도성 수성체제와 관련하여 기병강화 배경을 심도있게 고찰하였다. 그리고 병서의 간행과 관련해서는 조선전기의 군사체제였던 五衛制와의 연관성을 살펴 이것이 국왕권의 강화와 어떠한 관계가 있는지 면밀히 분석하였다. 구체적으로 도성 삼군문 수성체제의 변화 안에도 오위체제를 위한 변용의 흔적을 찾을 수 있었으며, 내란에 보다 빠르게 대응하기 위한 금군 기병대인 용호영의 창설을 이끌었다고 볼 수 있다. 또한『陣法』과『兵將圖說』및『續兵將圖說』의 재간행 양상의 분석을 통해 오위제를 통한 강력한 군권 확립이 영조대 군사훈련 변화까지 영향을 미치고 있었음을 확인할 수 있었다. 이러한 영조대의 조선전기 오위제 복구론의 정착은 기병의 강화와 직결되는 부분이었다. 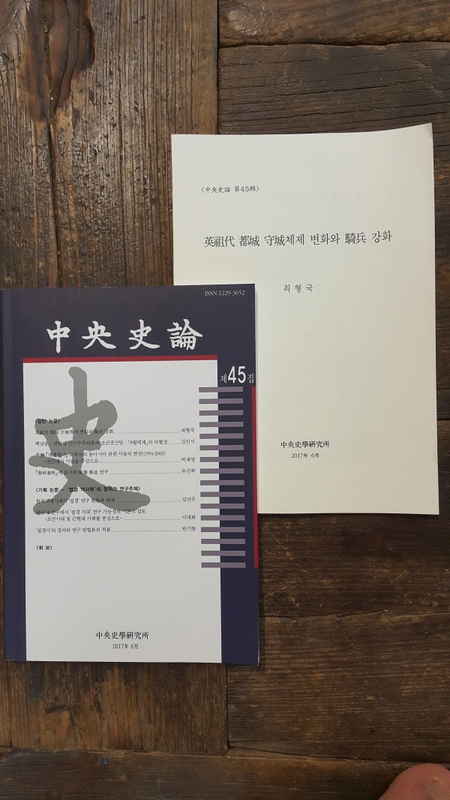 This paper was tried to research the change of the the capital city castle defense system by the process of Musin(戊申)-Revolt, and to research the unification of the military power for royal authority reinforcement of the King Yeongjo and the decentralization issue by the change of military strategy book. Specially, in the process of the Musin(戊申)-Revolt, the background of the enforcement of cavalrymen in connection with the city wall defense system was considered in-depth by analyzing the form of the royal forces organization for suppressing a rebellion and the form of strategy used at the time. It was studied in depth that the relationship between the publishing the military book which was interrelationship with Ouije(五衛制) which was the military system at the former part of Joseon dynasty and the royal forces. For example, in the change of the defense system for the capital city castle Samgunmun(三軍門) the evidence of the transformation was there, and made the establishment of the Yonghoyoung(龍虎營) which was the palace guard for confronting rebellion. Additionally, we can check that the strong military takeover by Ouije(五衛制) had an effect on the change of the military training at the King Yeongjo period by analyzing of the aspect of republishing 『Jinbup(陣法)』, 『Byeongjangdosul(兵將圖說)』, 『Sogbyeongjangdosul(續兵將圖說)』. The settlement of the restoration of former period in the Joseon Ouije(五衛制) was directly connected to reinforcement of cavalry for King Yeongjo.